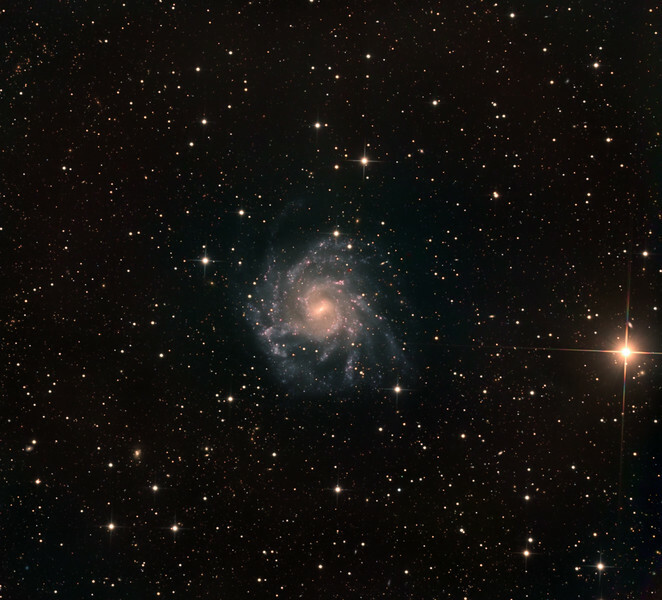 NGC 7424, a starburst grand design spiral in Grus. With a surface brightness of only 15 mag/sq min, this is a faint target. The brilliant K class orange star at 3 o'clock is magnitude 6.7. We call the galaxy "Chopin", on the grounds that the multiple spiral arms look like someone playing a frenetic arpeggio on the keyboard. There are many distant orange elliptical galaxies, often in clusters. Lum: 15hrs in 1hr subs. RGB: 3hrs each in half hour 2x2 binned subs. Aspen CG16M on 20" PlaneWave. Field approx 35' across.